Tuesday evening was the Simon & Schuster author panel at the Provo City Library. It was a BLAST. I went with my book club buddy Melanie (hey again, Mel!). YA authors Becca Fitzpatrick (LDS, Hush, Hush saga), Moira Young (Blood Red Road, see previous post here), Elana Johnson (LDS, Possession), and Michelle Hodkin (The Unbecoming of Mara Dyer) attended. They were so great and you could tell they were good friends too. It was fun to see them play off of one another and crack jokes. I'll type up the notes for a Friday Highlight in the near future. After the discussion, the book signings went smoothly and I got to attend my first after party, book blogger meet-n-greet with the authors! Man, book bloggers are cool (I still feel like such a newbie though so my cool-ness factor is slowly increasing -but boy is all of this a ton of fun!). Wednesday, I had THREE Book Adventures! First, I visited BYU English professor and published author Chris Crowe (Two Roads, Presenting Mildred D. Taylor). It was a fantastic visit. Especially because Professor Crowe specializes in young adult literature! 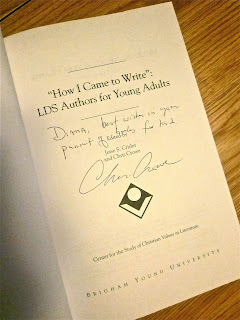 He helped produce the book How I Came to Write: LDS Authors for Young Adults which he signed for me. We had a great conversation about his upcoming works, his classes, and LDS authors. I'll type more later about our visit, but for now check out this radio interview of Chris Crowe talking about LDS YA authors. After my meeting with Professor Crowe, I zipped over to the Barry Lopez lecture on campus. I was very excited to meet Mr. Lopez and get his autograph in the ONE youth book he's ever written (and I've had it in my possession for 12+ years! Not the ONLY copy. I mean I have A copy of the one youth book he's written). It's called Crow and Weasel and is an original American Indian-esque folktale. I'll feature it (and my short, but special experience with Mr. Lopez) in an upcoming Children's Tuesday post. Mrs. Andersen is an illustration professor at BYU and has illustrated many children's books. Check out my previous Bethanne Andersen post here. Thursday, I had the opportunity to listen to a great lady give a lecture on campus, and then get her autograph a few hours later. Susan Campbell Bartoletti spoke about her incredible non-fiction, youth books as well as read her newest picture book Naamah and the Ark at Night. I cried. Silently (for realz). Her presentation was that good (or I am just that moved by certain things). Again, I'll post about this presentation for a Friday Highlight. On Friday, I attended the Children's Literature Association of Utah event at the Orem Public Library presented by Michael O. Tunnell and Colonel Gail S. Halvorsen about the book Candy Bomber: The Story of the Berlin Airlift's "Chocolate Pilot". This was an awesome and totally packed event. See my previous Children's Tuesday post about the book. I'll post the presentation notes on an upcoming Friday. Mr. Tunnell is an English Education professor at BYU (check out this post concerning my past visit with him) who specializes in children's literature. Colonel Gail S. Halvorsen is the original pilot after WWII who dropped candy to the starving children of West Berlin. The NaNoWriMo meet-n-greet was held Saturday afternoon at Dragon's Keep, downtown Provo. I met a bunch of cool writerly folks and made some new friends. I'm SO excited to begin writing in November! The next local NaNo event will be the kick-off party on Oct. 29, from 6-9 PM at Dragon's Keep (260 N University Ave.). There will be pizza! Saturday, Oct. 22nd, from 1:00 - 4:00 PM, is the Orem Barnes & Noble Authorpalooza! Folks, THIS IS GOING TO BE A BIG EVENT. Like, tons of authors are going to be present. So many that even the event page on B&N had to stop by saying "and many more!". And boy do they mean it. From the event page and sleuthing around on the net, I have compiled a list of the youth authors who are scheduled to attend (I even discovered a couple of new ones!). Here it goes: Jessica Day George, Jenni James, Debra Hulet, Frank Cole, Berin Stephens, Kim Justesen, Kristen Chandler, B. K. Bostic, Paul Talbot, Cindy Hogan, Michael Young. There may be other youth authors at Authorpalooza that I couldn't find event listings for. And then there will be a ton of non-youth authors who are pretty darn cool too. **AND (I just found this out from Jessica Day George's blog) there will be copies of Jessica's not-officially-released-yet book Tuesdays at the Castle available for purchase! I'm totally buying one! Also on Saturday, at 2:00 PM, is the meeting for the Provo Chapter of the Forever Young Adult Book Club at the Cocoa Bean Cupcake Cafe at Brigham's Landing in Provo. The discussion will be on Markus Zusak's The Book Thief. And don't forget that the Hundred Dresses play, based on the Newbery Honor book by Eleanor Estes, is going on now through Saturday, Oct. 22 on BYU campus. I do find a lot of things to keep be bookishly busy around here, but every time I hear about the events at The King's English up in Salt Lake I wish it was closer! I'm always amazed at how much is going on! Yeah! And I miss you!